by D. Benson Tesdahl. BoardSource, 2010. Creating an equitable framework for self-governance is a difficult task for a congregation. 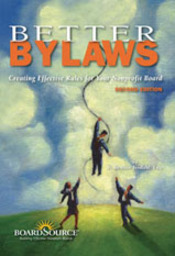 Former law professor and author Benson Tesdahl meets this challenge via a congregation’s bylaws, offering “a basic definition of bylaws and an overview of the issues and areas bylaws should address.” Among the topics that Tesdahl says need to be in the bylaws are board member education, dismissal, openings, “terms and limits,” “conflicts of interest,” and “standards of conduct and codes of ethics.” He also discusses finances and amending the bylaws. An accompanying CD and the five appendices give readers downloadable examples of policies and procedures, including one for “whistleblower protection.” Tesdahl suggests starting with basic bylaws and amending them as needed. He also cautions: bylaws “need to be tailored to an organization’s specific contexts.” This secular resource is appropriate for any religious group, whether they are reworking their current bylaws or writing an initial draft.